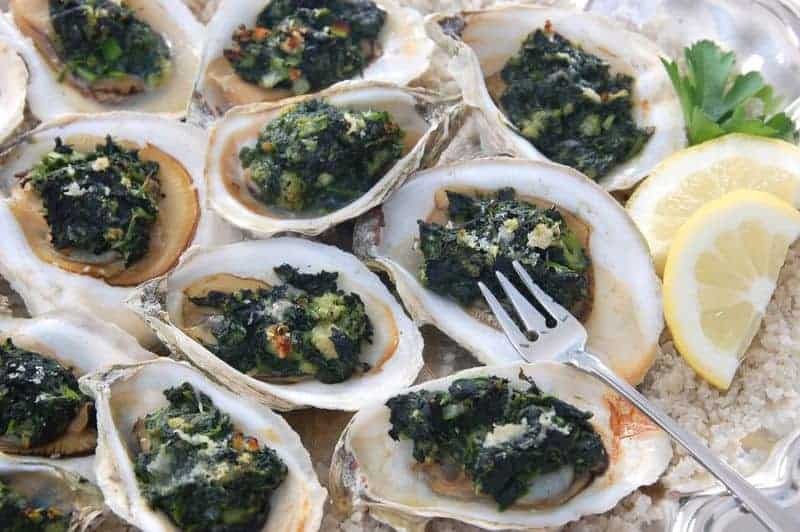 Commander’s Oysters Rockefeller is a classic way to enjoy Oysters. Oysters are cooked with green herbs, butter, and other seasonings. These were originally named for Rockefeller when they were created. You don’t have to be Rockefeller to enjoy this classic dish. For more great Commander’s Palace recipes check out The Commander’s Palace New Orleans Cookbook . Yield: 4 to 6 appetizer servings. You can recreate these famous oysters at home. Brown bacon; add garlic when nearly brown. Add butter and shallots. After cooking a few minutes, add spinach and all other ingredients. Thicken with enough breadcrumbs to make thick, and simmer for about 10 minutes. Have 12 pie pans half filled with rock salt. Arrange 6 oyster shells in each pie pan. Top each oyster at room temperature in its shell until heated through and browned on top.While you can't get real absinthe here in the United States, it is illegal, you can get many other liquors that taste very similar, and they are labeled as absinthe. Absinthe is legal and available once again – try Lucid. You cant get Absinthe anymore. At one time was used as a very addictive narcotic. I have a very old cook book from Louisiana, there are recipes in it that call for Absinthe. These were the perfect appetizer.